Elisabetta Gardelli thought she’d spend her days serving coffee and writing obits for the town paper until an unexpected opportunity results in her dream job as a journalist. Now, divorced and determined to make it on her own, Lissa is hired to do a series of interviews about entrepreneurs who’ve made their mark at an impressively young age. First up? Wall Street mogul Trevor Dane — Lissa’s first love. Lissa hasn’t seen Trevor since he left the small town of Serendipity to earn his spot on the right side of the tracks. Ten years have passed but neither has really moved from their super-passionate teenage affair – or the heartbreak that followed. This reunion can be their second chance or it can provide much needed closure. It all depends on Trevor. Can he forgive Lissa or will the past continue to stand in their way? When Carly announced on Twitter that she was releasing a novella set in the town of Serendipity, I got all sorts of excited, asked if she wanted to do some promotion with us, and then nearly fainted when she offered me an advanced look. I loved the town of Serendipity and the folks in it, so this was a super sweet treat for me! We only had a few moments of page time with Lissa in Serendipity, and she wasn’t exactly portrayed in the greatest light. But I always got a sense that there was so much more to her, and was hoping we would get more time to know her better. What we don’t see is that Lissa has had it rough. Her history in the small town wasn’t easy, and because of one dumb choice in high school, she ruined the best relationship she could have hoped for. Now that she is divorced and working on interviewing up and coming business men, Lissa will have to come face-to-face with the boy who left her behind, the one she let get away. Trevor took Wall Street by storm and while he hasn’t stopped thinking about Lissa, he refused to let anyone tell him about her either. When she walks into his office to interview him, all the emotions from high school come back and Trevor realizes he is far from over her. But with the vast amount of history behind them, will they be able to come together as adults and admit they let the real thing go all those years ago? I absolutely adored this story! It’s a short one, but it packs quite a punch in the small time we have with Lissa and Trevor. It’s obvious from the get-go that both Lissa and Trevor are still deeply in love with each other, despite the years and distance. But despite that love, there is also a bit of distrust and uncertainty, especially for Trevor. I really liked that Phillips had Trevor struggle with his decision to try again with Lissa. He was obviously hurt by the way things ended between them, and yet even after they rekindled their physical relationship, Trevor wasn’t ready for more. I was glad to see him be the one to struggle with trust issues and a little insecurity as to whether or not Lissa would hurt him again. It was real and emotional and I loved that he didn’t hold back in his honesty with Lissa. Although the story takes place over just a few short days, it feels like there is so much more going on. The short story packs an emotional punch and the tension between Lissa and Trevor starts strong and simmers until it finally explodes. There is a wonderful smexy scene that is not only hot but very heartfelt as well. 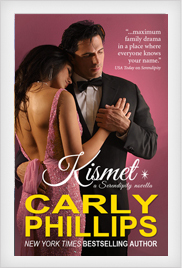 All in all Kismet is a wonderful novella to add to the Serendipity series. The connection between Lissa and Trevor is unmistakable and their romance was quick and yet so sweet and romantic. Fans of Phillips and the Serendipity series will want to make sure they get their hands on this novella!